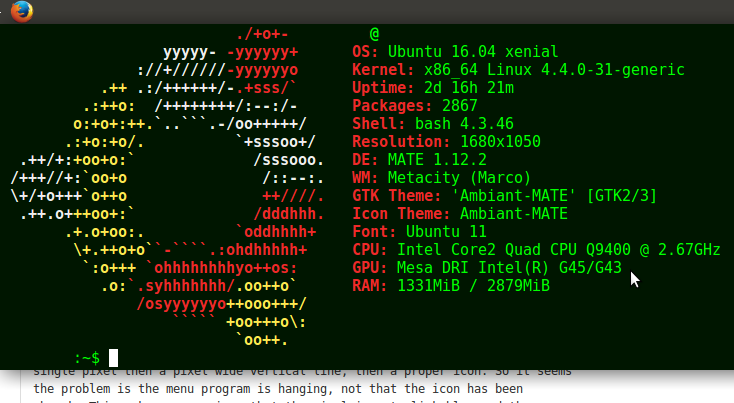 I am running 16.04 Ubuntu-Mate with the latest LTSP. When I first installed, I was able to use the "advanced menu" under Mate tweak using the Redmond panel layout. After the updates on the third of May, the menu disappeared, and was replaced only with a single pixel. I tested the main server through X2go and the menu appears, so it is limited to remote display. If you need more info, please let me know. Noticed during a slow boot that, when properly operating, the icon first is a single pixel then a pixel wide vertical line, then a proper icon. So it seems the problem is the menu program is hanging, not that the icon has been shrunk. This makes sense given that the pixel is not clickable, and the keyboard shortcut does nothing while the problem is active. This has been an on and off problem for some time. All users of this machine are susceptible, though not necessarily at the same time. OpenSuse has a closed bug about this but the comments didn't help me find a cause. When the icon is reduced to a single pixel, the pixel is not clickable, and the hotkey stops functioning. Rebooting can fix it, but in the past not often. The only 'fix' i have for now is to F12 tilde to manually invoke mate-tweak and uncheck advanced-menu. (partially) it is now broken on X2Go sessions and works in LTSP. > machine are susceptible, though not necessarily at the same time. > but in the past not often. > tweak and uncheck advanced-menu. > ** Attachment added: "mate-menu_1Pixel.png"
> limited to remote display. If you need more info, please let me know.